Estebon sat reading the Neopian Times in the reception area of the Petpet Laboratory waiting for his turn under the zapper. He was currently in the form of a blue Kadoatie fresh from his last mission at the Kadoatery, and despite all of the pampering he was very much looking forward turning back to his original self for a while. “Would you like me to come with you?” asked Hendro his owner, a shadow Shoyru and a detective for the Defenders of Neopia. Estebon walked to the chair as he had done many times before and waited for the zapper, concentrating on his true form. 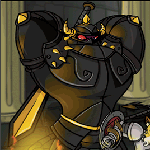 He was the only petpet in all of Neopia that could choose which petpet he wanted to be turned into at the lab ray, as long as his cause was noble. “STOP!” Shouted detective Hendro rushing in. The Kookith jumped back in surprise, knocking over a box of tools with a claaang. “And what is it that you require of me?” Estebon asked. Estebon exhaled a resigned sigh. Although he had been looking forward to returning to normality he had to admit his interest was piqued. The Kookith and Hendro stepped back out of harm’s way. A blinding light filled the room coupled with the fizzle of a thousand volts, and suddenly both were replaced with a thick dark smoke that clogged the senses. Hendro coughed and spluttered, wafting his arms and wings to clear the smog from the room. Walking towards the chair he could make out a new figure, no longer Kadoatie shaped but smaller, canine like with four ears and a bushy tail. The Scientist ushered them out of the room and called in the next petpet for zapping. Estebon smiled a huge wolfish grin. The Spooky Petpet shop was located inside of an ancient tree and was surprising roomy inside, with its cavernous walls shelved top to bottom with mysterious jars, dusty books, peculiar clocks and, of course, petpet cages. Sat in one of these cages Estebon waited for any sign of abnormal behaviour, although it was difficult to ascertain what might be considered more unusual than normal here. Evening was drawing in and he was observing a Skelly escape from its cage for a third time by sliding its bones individually through the bars and reassembling on the other side. The vampiric Cybunny running the shop was over again in a flash to lock it away again, but stopped, distracted, when all of the clocks chimed and cuckooed at once signalling closing time. It closed all three of its eyes in concentration and suddenly the cage door shuddered and flew open. It bounced out and opened its umbrella to float gently down to the floor, and set off to free other petpets from their cages. The escaped Skelly had already started to do the same from the other side of the room, and had a trio of colourful Slorgs sliming closely behind it. Estebon jumped back as far as his cage would allow when the Psimouse appeared unexpectedly at the door and whooshed it open. It lingered there looking at Estebon, blinking its eyes in turn. “The outside is a Zomutt, but the inside is something else!” It remarked to no one in particular. Estebon left his cage cautiously. “So, you left yourselves out of these confines often?” He asked. He bounced down from Estebon’s shelf onto a large table littered with odd nick-knacks and began swaying to music that Estebon could not hear. Estebon pounced down next to a Grobrin who was clawing at an antique looking cupboard. “Grrooo…” the Grobrin growled in response. “It doesn’t talk, that one,” Nifty suddenly appeared again “at least, not with its mouth. The one named Nifty will translate.” The Psimouse faced the Grobrin and closed its eyes. After a moment it spoke, its regular shrill voice was replaced by a deeper, gruffer one. “Noises? What noises are these?” Estebon asked. “Wait.” The Psimouse growled in return. It then stepped back, blinking, ending whatever psychic connection there was between the two petpets. “A dark chill? Is there any such thing? And what will start?” Estebon was tired of receiving half answers to his questions. “Wait…” Nifty repeated, this time in its squeaky voice. Estebon paused briefly but nothing seemed to be happening. 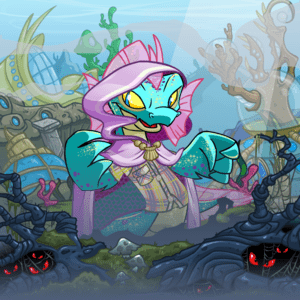 What in all of Neopia was he supposed to be waiting for? Then, abruptly, all of the petpets stopped what they were doing and faced the door. They inched closer together in the centre of the room, and Estebon was surprised to find himself doing the same, until he was tightly huddled inside the group. The quiet whisper of wind crept under the door and an icy breeze seeped into the tightly gathered group, freezing Estebon to his core. Many petpets had started trembling, and Estebon suspected that it was not entirely due to the drop in temperature. The wind got louder and the strength of the breeze increased; paper scattered about the room and wind chimes clanged angrily, until an enormous gust blasted in and snuffed out all of the candles at once. All of a sudden the noise stopped, the winds ceased and the bitter chill faded. The petpets remained clustered together, not making a sound but some still shaking. Was that it? Estebon seemed unable to find his voice to ask, so instead he ran through what Nifty had said earlier. It begins with a noise. Well, that had to be the wind moaning. Then a dark chill. That must have been the icy blast extinguishing the candles, he thought. Then it starts. What starts? He wondered. Several minutes had passed, and nothing had happened. The petpets had not dispersed from the huddle though, waiting for whatever was supposed to be happening now, and Estebon saw no reason to break away yet. Then, it happened. A low moan echoed around the shop crying Eeeaaaaahhhhh…. Eeeaaaahhhh… Over and over again. Estebon felt a presence in the room but saw nothing, until a cage door flew open across the room. The cage then lifted high into the air and was tossed against the door by some invisible force. Another door opened and another cage soared through the air, again and again until none of the cages remained in their original places. The tight huddle of the group lessened until all of the petpets had disbursed, leaving Estebon alone in the middle of the floor. He felt that perhaps he should hide too, however he seemed to be rooted to the spot, not knowing if the weirdness had stopped at last. Then he heard the cry again Feeaaaghh… right in front of his wolfish face, parting his fur with its force. One final low cry echoed about the room and the front door blasted wide open; Estebon felt a change of pressure in the surroundings and knew that the alien presence had left. “Well, that was new!” squeaked Nifty from a high shelf. Standing in the open doorway was Detective Henro, surveying the scene of destruction in front of him. As Detective Hendro and Estebon approached the Brain Tree they saw that there was a small gathering of confused looking pets talking hurriedly amongst themselves. A strawberry Chia turned to answer. “We’re all here to receive a Brain Tree quest, but we’re all being asked the same one, and we don’t know the answer!” She cried in despair. “You know, you must speak to the Esophagor. It will bestow answers upon those who bring it food.” Estebon replied. “Leave it with us; we’ll get to the bottom of this.” replied Hendro. They drew near to the Brain Tree and were quickly dwarfed by its massive size. Its bulging brain pulsated quickly and a voice boomed out of its gaping maw. “Yes, of course. What would you like to know?” Hendro called back. They clambered through the dense forest, thick with the stench of decaying leaves, alert for any signs of the Esophagor. The barren trees closed in on them, their bare branches reached like fingers and grasped at the two detectives whenever they got too close. Estebon sensed the Esophagor before he saw it; the ground rumbled beneath his paws, softly at first but with increased energy the closer they got. Then it came into view, a solid mound of mud and dirt with fiery red eyes that fixed on the pair as they approached. “Well the thing is, we need information, and time is of the essence.” Hendro replied. “So, we could run off and spend the night hunting down pumpkin cookies for you, or you can accept this devilled steak and spooky milkshake that I was saving for myself.” He lay the food down as close as he dared to the great mass. “Yoouu daaarree baaarrtterr wiithh the Grreeatt Essophaggorr? !” It asked incredulously. In response the Esophagor chomped down the offering in one enormous gulp. “Searching for what?” Estebon and Hendro asked together. The detectives made their way to the Witch’s Tower following the winding dusty path that the Esophagor indicated; it had instructed them to only take right turns no matter what, but it felt to Estebon as through whey were going round in circles. The paths were dimly lit by ancient street lights, and on each illuminated tree and post ahead of them were pictures of the missing Neopet. Estebon found them oddly familiar, and after a while was able to place the nagging recollection. “Is that Dannox Kacheek? I recognise this picture from yesterday’s Neopian Times.” Said Estebon, only realising now that he did not know what the missing pet looked like. “Yes, the image has been circulating for a few days now. He looks quite the dapper fellow!” Hendro remarked. Judging by the pictures Estebon couldn’t help but agree; Dannox was dressed impeccably in a tailored three-piece suit, sat at a pearlescent piano with a petpet at his feet, surrounded by ornate and lavish items each more extravagant looking than the last. “I wonder who will inherit his remarkable fortune.” Estebon mused aloud. The Witch’s Tower emitted a sickly green glow that seemed to draw them in, and before they knew it they had marched straight in and up to Edna, who did not look up from the cauldron she was stirring. After a moment of waiting Detective Hendro cleared his throat audibly. “Ahem, yes, well… There is a recently deceased Neopian drifting restlessly around the Haunted Woods in search of goodness-knows-what, and we would like your help to soothe his spirit so that he can pass on in peace. Is there anything that you can do?” explained Hendro. “If I accept what, madam?” Estebon replied dubiously. Estebon was taken aback. “And what purpose could these things possibly serve you?” he asked suspiciously. Estebon received a pleading glance from Hendro and quickly agreed with a sigh. A few swabs and snips later and the trio were assembled around a dusty wooden table littered with old scrolls and crystals, and a faded Ouija board in the centre. Hendro handed over the picture he had used to make his missing Neopet enquiries to the green witch. Edna took it and wrapped it carefully around a wooden marker and placed it in the centre of the board. “Hmmmmm…. Hmmmm…” She hummed with her eyes tightly closed in concentration, and the detectives watched the table closely for any signs of movement. It didn’t take long. Within minutes the marker swirled slowly around the edge of the board. “Is this Dannox Kacheek?” Edna asked with a croaky voice. Her eyes remained unopened, leaving Estebon to wonder how she possibly knew that the marker had even moved. Hendro gasped in surprise when the marker stopped its swirling on the word ‘YES’ before resuming its movement. Once again, the marker paused briefly on the word ‘YES’. The encased marker stopped its circling and moved straight towards a letter. “Fia?” Edna and Hendro asked together. Hearing this word aloud seemed to agitate the spirit; a loud “Eeeaaaaahhhhh!” filled the room and the marker spun faster and fasted round the board until it became a blur. “What is it, Estebon?” Detective Hendro asked. The marker shot abruptly to the word ‘YES’ again. “Where did you last see Fia?” asked Hendro, intrigued. The trio watched as the marker carefully spelled out its final message. Estebon and Detective Hendro climbed the broken stone staircase up to what they hoped was the final destination of the night. In the distance the faint light of dawn crept over the horizon, casting a ghostly glow over their surroundings. Estebon dashed swiftly inside and made his way down the stairs into the darkness. He was immediately faced with a choice of three identical candlelit corridors and chose the one on the right, remembering the Esophagor’s instructions for navigating themselves around the Haunted Woods. This was a long and cobwebbed corridor with rooms branching out on either side; most were empty save for ectoplasmic splodges; several had petpets scurrying about, and one was even filled wall to wall with chests overflowing with neopoints and jewels. Estebon began looking in each room for Fia, however it soon became apparent that there were far too many to search extensively, and he instead relied on his instincts to find the missing Zomutt. He threw a cursive glance into each room, listening out for signs of a petpet in distress or maybe a friendly cultist to question, but signs of the missing Zomutt were thus far non-existent. After an hour he flopped down, exhausted. He realised that he could be stuck in here much longer than anticipated, and his stomach growled gently reminding that he probably should have eaten before embarking on this excursion. He heard the grumble again much louder, and realised that it was coming from the corridor ahead. Estebon listened carefully and heard a yelp, followed again by an ear splitting roar, and in the distance saw a small Zomutt running wildly towards him. Before he could introduce himself and explain the situation a blast of fire filled the corridor behind the petpet and an enormous red dragon came into view, bounding after her. Fia ran straight passed Estebon and he followed suit, shouting to her as they bolted from the dragon. They ran down corridor after corridor barely looking where they were going, and the sounds of the dragon began to quieten behind them until they stopped completely. Up ahead the petpets spotted the exit to the catacombs and made their way towards it. Fia reached the door and noticed that Estebon was no longer at her side; whipping round she saw him leaving one of the rooms with an unknown treasure in his mouth. “What’s that?” She asked, but he was only able to offer a muffled reply. The petpets made their way into the morning light and spotted Hendro waiting anxiously and rushed to greet him. They stopped in their tracks suddenly when a loud crack! Sounded in front of them, and a ghost Kacheek appeared floating in the air. “Dannox!” Fia cried out, excited to be reunited with her owner once again. Dannox looked overjoyed to see his beloved Zomutt, but seemed unable to communicate anything other than a long and low moan. She began to sob uncontrollably; Dannox rushed to console her but floated straight through the Zomutt, making her cry even louder. Estebon walked forward and placed the item he had snatched from the catacombs in front of Fia softly. “W-w-what’s t-this?” she asked between breaths. Fia’s sobs subsided into soft hiccups as she considered what was being offered to her. “Yes, you will. You will be just like him and be able to do everything that he does.” Estebon explained. “Then yes! Of course I will!” Fia exclaimed. Upon hearing this Dannox moaned louder, clearly delighted with his petpet’s decision. “Here, Fia. I am Detective Hendro – please let me do the honours.” Hendro offered picking up the paint brush. A moment later a transformation struck the Zomutt, and slowly from her head down her colour faded into a ghostly pallor and she began to hover weightless above the ground. She opened her mouth to thank the detectives, but instead a moan escaped. “That’s ok, we understand.” Hendro said with a smile. Fia leapt into Dannox’s arms and licked his cheek. Both beamed at the detectives and Dannox waved a final goodbye, and both pet and petpet disappeared with another ear-popping crack! Detective Hendro’s pocket began to ring insistently and he and Estebon laughed as they left the mystery of the Haunted Woods behind them.